Letlhogonolo added another success to his inspiring life story when he received his BCom degree in economics during the North-West University’s (NWU’s) April autumn graduations. Born in Matshepe Village in Mahikeng, he uses his feet and mouth to write, control a computer and eat. Throughout his life, Letlhogonolo has shown nothing but dedication and persistence to reach his goals. He demonstrated this by passing matric with flying colours, and earning himself a R25 000 bursary to further his studies. The former North West MEC also presented him with a merit award and a laptop for his extraordinary achievement. Not one to allow himself to be put down by adversity, Letlhogonolo Mafela is also a DJ for public relations company Go Infinite Holdings, and also made an appearance as guest DJ on Motsweding FM. His positive attitude and hard work have not gone unnoticed, as he was nominated for the Live Your Dreams Awards in the Best DJ category for 2018. Prof Marilyn Setlalentoa, deputy vice-chancellor for operations on the campus in Mahikeng, commends Letlhogonolo for his achievement. "Letlhogonolo is an inspiration to all of us,” she says. “He is a perfect example of what you can achieve if you believe in yourself. Disability is not inability." As he enters the job market as a graduate, Letlhogonolo’s determination and will to succeed make him, along with many who live with any form of infirmity, a force to be reckoned with. 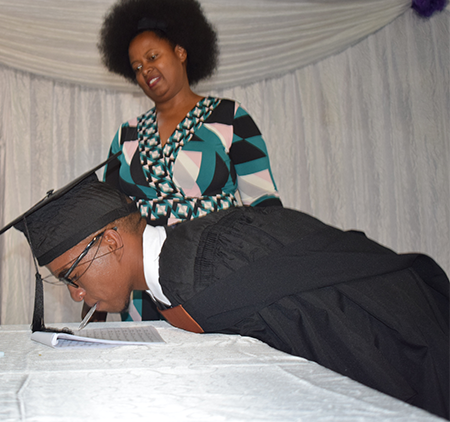 Letlhogonolo signs for his certificate on his graduation day.